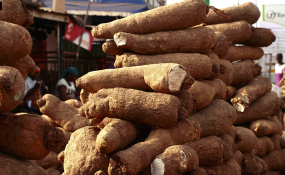 Efforts by the federal government to diversify the economy is beginning to yield results, as the federal government is set to export 72 metric tonnes of yam to Europe and the United States today. In a major diversification breakthrough, the minister Of Agriculture, Audu Ogbeh, announced yesterday that the Federal Executive Council (FEC) has approved the exportation of yams to the United States and United Kingdom. Ogbeh disclosed this to State House correspondents after the weekly FEC meeting presided over by Acting President Yemi Osinbajo at the presidential villa, Abuja. The minister was joined at the FEC briefing by his science and technology as well as Health counterparts, Ogbonaya Onu and Isaac Adewole respectively, and Special adviser to the president on media and publicity, Mr. Femi Adesina. Ogbeh noted that his ministry informed council that last week, they completed arrangements for the first formal export of Nigerian yams to the United Kingdom. He said, "Some people have asked whether by exporting yams we are not going to subject Nigeria to hunger and I had to inform council today that that will not certainly not rise. You will remember that about February or March this year some of you asked the same question: 'is Nigeria going to face famine?' and I said it cannot happen. Apart from the crisis in the Northeast, we definitely are not short of food. Although prices are high in some areas, we are not short of food. "Tomorrow, we shall flag off this export in three container loads containing 72 tones of Nigerian yams. Two containers went out in February; one arrived in New York on the 16th of this month. This is important because for those of you who travel and many Nigerians out there, you go to shops where they sell African foods and you never see anything from Nigeria. It is mostly called Ghana yams. "Now, we account for 61% of the total output of yams in the world, according to the Food and Agriculture Organisation. The rest is shared between some countries in West Africa and the West Indies. For us to go abroad and not find Nigerian yams in the market is an embarrassment". Ogheh observed that Ghana is targeting $4 billion from yams in the next three years and if they can do that, Nigerians who are the masters of yam production have no business lagging behind. He also observed that Nigerians don't even consume all the yams they produce because most of it is lost to wastage due to poor technologies in preservation. He further explained: "We are going to provide solar coolers in yam markets and yam producing areas to keep the temperature at 14 degrees Celsius; not frozen but to keep it at that temperature so that it can be good all year round and can last up to two to three years in the containers. "Essentially, we are making this point because we are diversifying the economy. We are talking about economic recovery and growth and we will have to export whatever is needed from Nigeria by other countries so we can earn more foreign exchange, rather than expend everything we have on importation. If they want yams we will sell yams, if they want pepper we will sell pepper, if they want ginger we will sell ginger. "Just like we buy so much from them, it is time for them to buy from us. I assure you this is how the economy of Nigeria we are dreaming of is going to recover. The only challenge we may face will be the question of labour. The young men who make heaps are reducing in number because they are moving to the cities, riding 'okada' and looking for white collar jobs". The minister specifically noted that to solve that problem, the government is mechanising the production of yams and has designed a new plough that will be attached to the tractor to make the yam heap, adding that the current ploughs in the country cannot make a heap. "In Illorin, the Nigerian Centre for Agric Mechanisation is producing a new plough that can make the yam heaps and once that is in operation, we will mechanise the production. We should look at the opportunity to export yams not as a problem but as an economic opportunity", he added. He also disclosed that food exports have gone up in Nigeria in the last one year by 82 per cent and that government wants to make sure that what is produced meets the finest standard in the market. Ogheh continued: "We have shipped some to the US. This consignment is for the UK. I was in Dakar just two weeks ago and Nigerians there said they need yam from Nigeria as well that can go through trucks. "But the other good news is cashew nuts; this things look small. We are in conversation with Walmart, the biggest supermarket chain in the US. They came here and asked us to roast cashew nuts for them. Their demand is 130,000 tonnes of cashew nuts per annum. The total value is $7 billion but what we are doing now is shipping raw cashew to vietnam. They are the ones roasting and selling to the US. This year, we are going to create six cashew processing factories in Nigeria, one to be sited in Enugu, Imo, Benue, Kogi, Kwara and Oyo States. These are the cashew belt for now. "These things are coming because at last, Nigeria is beginning to focus on non oil export. Once you can diversify your economy, if something goes wrong in one sector you can hang on to the other. This is yam; we are looking at industrial starch for the textile industry and for export to China". On his part, Onu said his ministry presented a Science and Technology and Innovation roadmap for 2017-2030. He also disclosed that by the ministry's projections, there are estimates that by 2050, Nigeria, by purchasing power parity, will be the ninth largest economy in the world but cannot get there without Science and Technology. He said, "We have been so worried that in our country, children and pupils in secondary and primary schools do not like to study Mathematics and Science subjects and that has been a worry to us as a nation. "We see that our lack of interest in science and technology has resulted in. If we want to embark on major projects in the country like building a dam, a refinery or airport or seaport, we rely on foreign expertise. "When it comes to Science and Technology many things that we can't do has to be done from outside. This has created a lot of problems for us as a nation because when you import these things you arevalso exporting jobs, creating unemployment for our people and putting undue pressure on the currency and also aggravating poverty in the nation. The minister added: "We decided that this must change, that we must have a science technology roadmap that will take our people beyond where we are now to prepare Nigeria to be truly great nation where we will have the capacity to use the natural resources we have to meet the needs we have as a nation so that we can become self reliant. "In the roadmap, we also identified all the things that we need to do to place Nigeria in a position that it should be. In essence, there is difference between developed nations of the world that are the richest in the world and the developing countries that are poor. The main difference is Science and Technology and they now they apply it to nation building".